He finally took his first bath. He waited in his hole, alone and nearly forgotten, for 25 years. 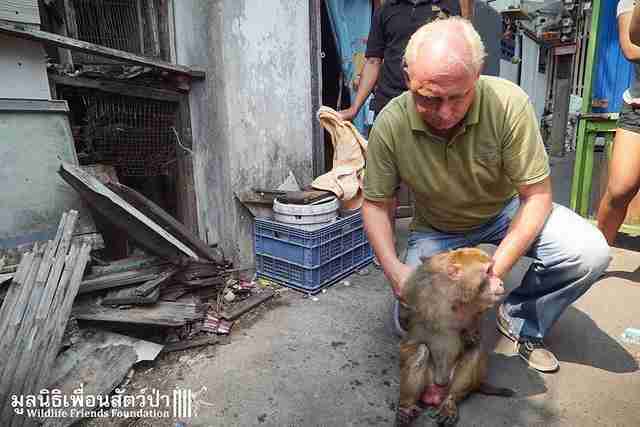 At least until Edwin Wiek, founder of Wildlife Friends Foundation Thailand (WFFT), received an email from a Bangkok resident worried about a monkey he had seen living in a "dark and dirty small hole in a slum," he said in a statement. 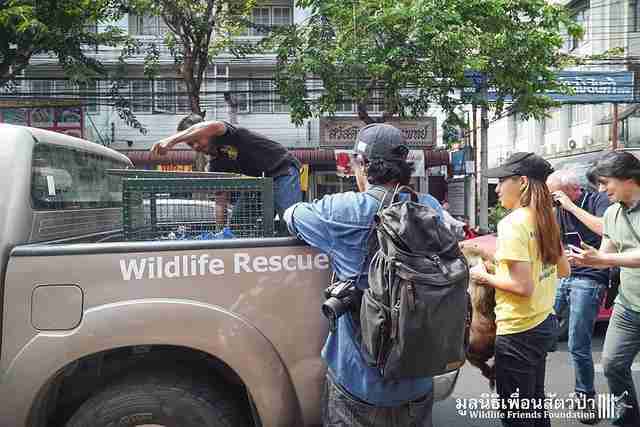 With little information, the WFFT team headed to the city to find out what was going on. 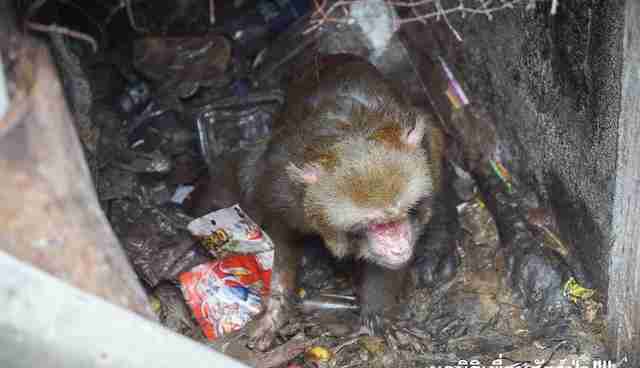 The man led them to a crowded neighborhood where they found the monkey, whom they later named Joe, packed into the dark space between two walls. His little face was peering out from the wire that held him in. 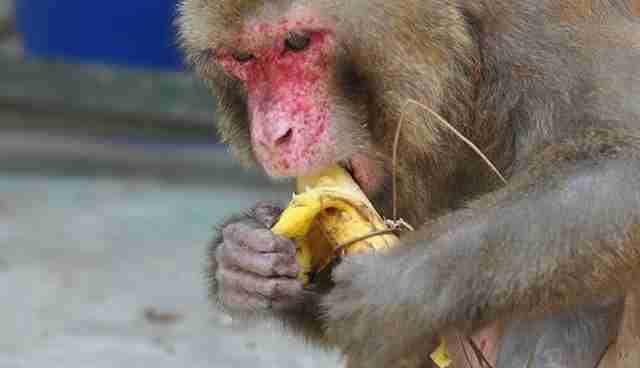 "I have seen a lot of animal suffering in the last 17 years, but I would say that the condition the monkey was kept in was probably in the 'top 10' of most horrible cases," Wiek said. The state they found Joe in was even worse than the picture they had originally seen, he added. Wiek described Joe's so-called home as a "hellhole." The small cage, sandwiched between the two buildings, was less than 3 feet long. Joe had no water, and was in near darkness except for the the sun that filtered through his little wire window. He lived in dirt and feces, and photos show that the floor of his hole was a solid mass of garbage and filth. When the team began to disassemble the prison, they found it was full of rats. 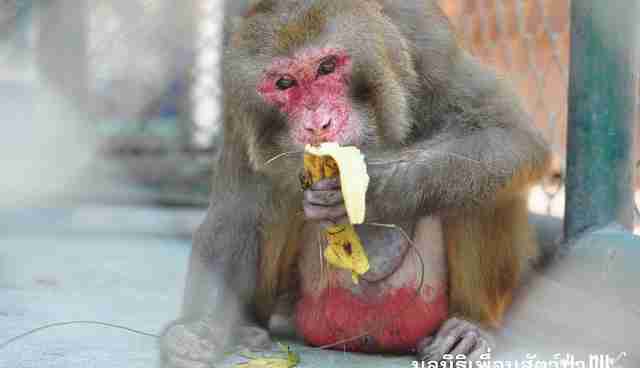 Even worse, Joe's owner told WFFT that he had been living like this since 1991 - an incredible 25 years of forgotten suffering. 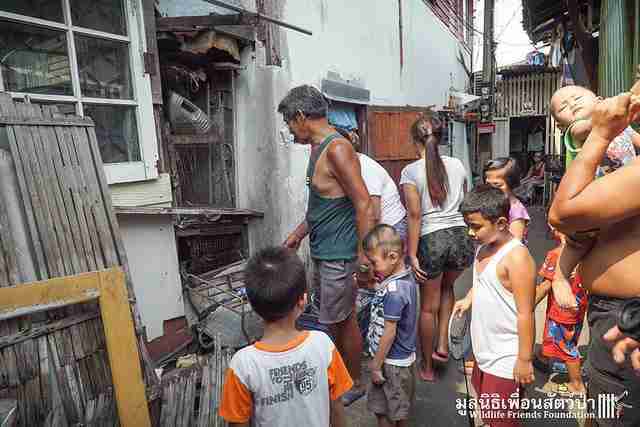 "When the owner told us how long he had been in there I was absolutely shocked," Wiek said. The team got right to work, tearing down the rusted walls of Joe's cage. When they pulled him out, they found that his two-plus decades in the tiny crawlspace had taken their toll on him. "Joe was dirty and very weak, as his cage was so small he could not walk or climb at all and his muscle tissue was almost gone," Wiek wrote. "His teeth were very bad and he was dehydrated." Fortunately, having tracked down Joe's owner, they were able to obtain permission to take Joe home with them. 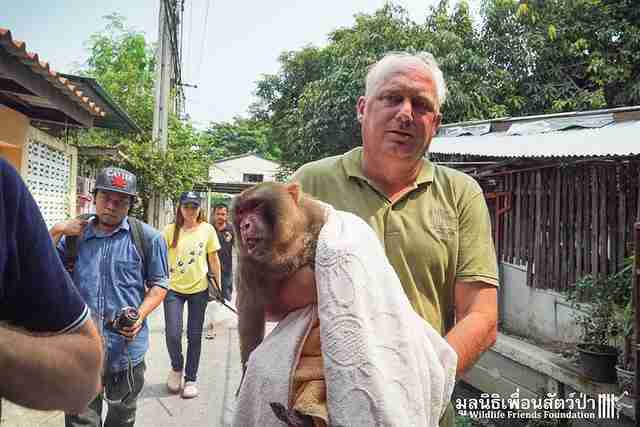 The owner was happy to see Joe rescued, Wiek said, and told WFFT that the Bangkok Zoo had offered to take the macaque years ago but had asked for $100 per month to support him, which he presumably couldn't afford. Unfortunately, while Joe's sad plight might be more viscerally appalling than most, his story is anything but unique. 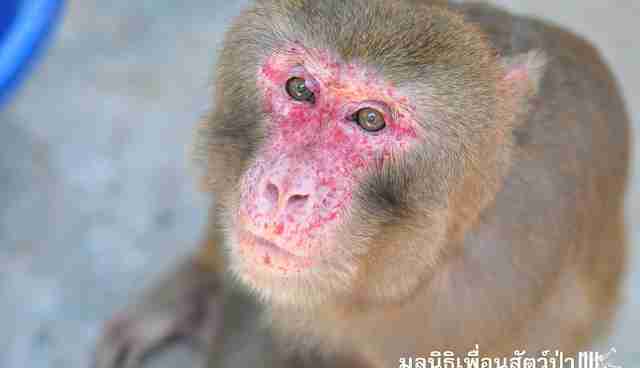 The wildlife trade is thriving in Thailand and other parts of Asia, with monkeys and other animals being killed for fur, meat and use in traditional medicine. 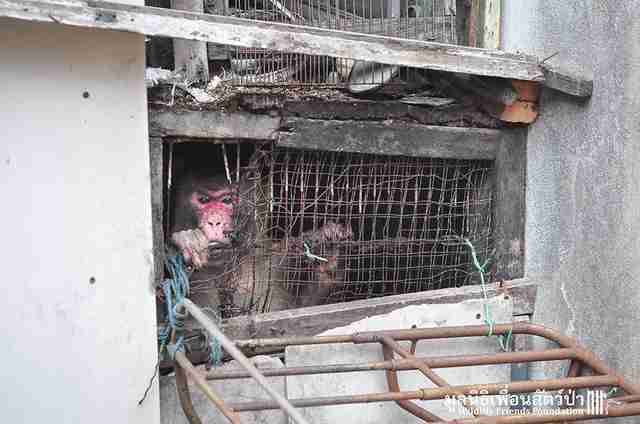 Mother animals are often killed so their infants can be sold into the pet trade, like Joe was. 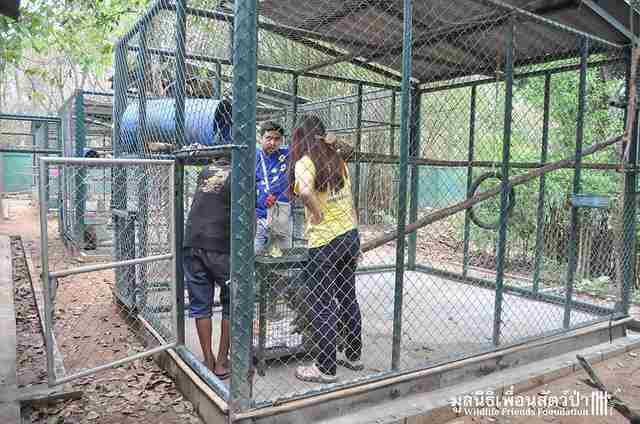 And WFFT is at the forefront of rescuing these animals. Just the other week, the team rescued an infant otter named Oscar who was being kept as a pet in a woman's home. Back in January, WFFT saved a group of slow lorises and a palm civet kitten who had been sold on Facebook; several were injured or missing toes. 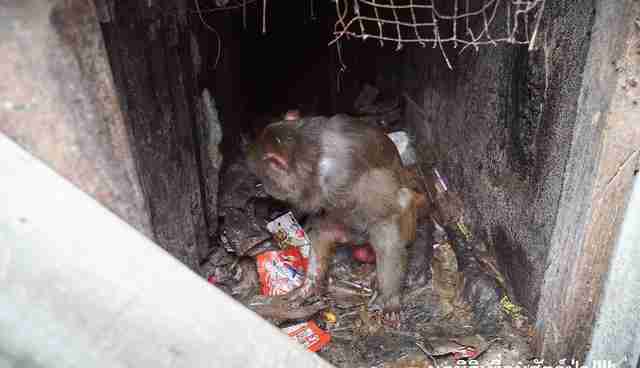 This week, WFFT rescued a northern pig-tailed macaque who had been chained to a tree in a yard for years; the tight chain was wrapped around her waist and cut right into her belly. Yet even with all the pain that Wiek has seen, Joe's face staring from that tiny hole between the walls stood out. 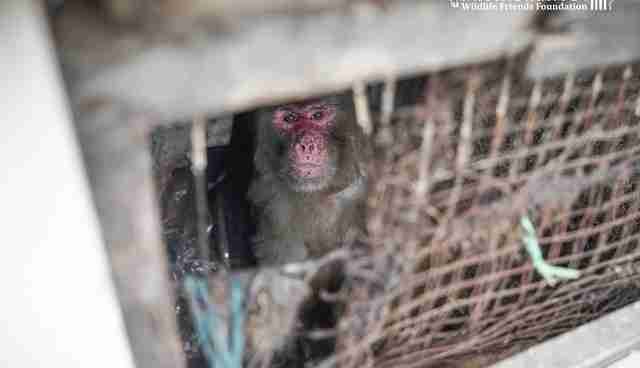 "On Tuesday I realised that all that time that I have been living and working in Thailand, this monkey has been in that cage, waiting for someone to rescue him," Wiek wrote, saying he had "mixed feelings" about the rescue. "I just wish we would have known earlier." "I felt embarrassed to be a human being, seeing what humans again and again do to animals, but at the same time I was feeling proud to be a human, being able to make a positive difference in this horrible case," he added. But for Joe, the only feeling that matters is that of freedom. And while there's a long road to recovery ahead, Joe has begun to perk up and explore his cage, taking advantage of his ability to move freely for the first time in decades. 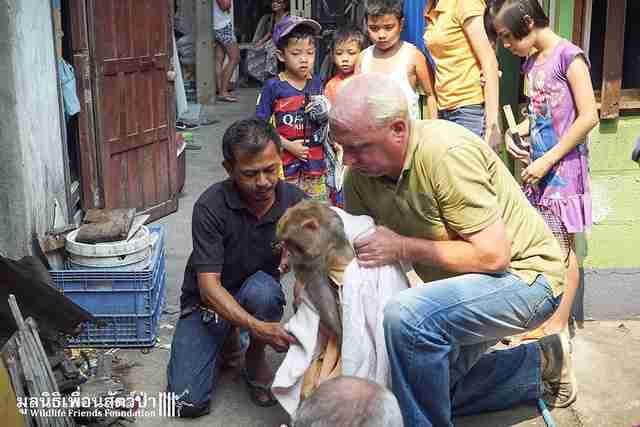 "He walks around but is not able to climb yet, too weak and without the experience to do so," Wiek said. "Joe was seen taking a bath in his clean water tub yesterday and has been communicating with his neighbours, other monkeys, whom he hasn't seen for so long." 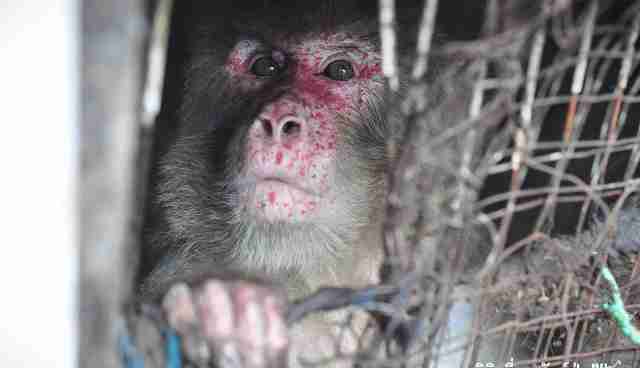 While Joe's spent most of his life locked away in his filthy cell, WFFT reported that macaques can live up to 35 years, and the team is hoping he will be able to close out his life in peace. "We hope he will still have some quality years ahead at our sanctuary," Wiek said, though he noted he's "afraid there are more cases to come." Want to help Joe get the life he deserves after so many years in his tiny prison? You can make a donation to WFFT and help the team continue its fight against the wildlife and exotic pet trades.